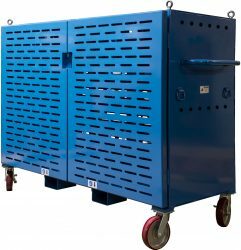 Simplify wire management with Wire Pull Carts (WPC) from BHS. These all-steel units include fully adjustable shafts to hang reels of virtually any size and weight, up to 3,000 pounds, with nylon grommets to ensure a smooth pull. The WPC makes it easy to transport bulk supplies of wire anywhere at the job site. It rolls easily on four swivel casters. Lifting eye bolts at all four upper corners allow users to pull the entire unit to upper floors. For even more versatile positioning, the WPC comes with stock fork pockets for travel via lift truck. A slim profile allows the WPC to travel through standard doorways and narrow aisles. Call 1.800.BHS.9500 to learn more about Wire Pull Carts and other electricians’ supplies from BHS.